First up is Phasma [Amazon | B&N | IndieBound], by Delilah Dawson. I wanted this book for two reasons. The first is that Phasma has been criminally underutilized in The Force Awakens and The Last Jedi. So much wasted potential, and I wanted more about her character. The second is because this is the first Star Wars book with my name in it. Sure, it’s in small print on the back book flap (author photo credit), but it’s a start! What impressed me most about this one was the frame story, which was used to talk about Phasma’s background and history. We know Phasma ends up as a high-level villain, which means her story isn’t likely to be a happy one. How do you tell her story without getting overwhelmed by the darkness and the hopelessness? You bring in an awesome Resistance spy named Vi. As interesting as it was to learn Phasma’s story, Vi and Cardinal ended up being my favorite characters. Cardinal is a nice contrast with Phasma, being of equal rank and genuinely believing in the purpose and ideas of the First Order. It’s still a dark story, but there’s hope as well. Well done, Dawson! Read an excerpt at Starwars.com. Next up is The Vessel of Ra [Amazon | B&N | IndieBound], by Catherine Schaff-Stump. This is one of the twistier books I’ve read in a while, about magical families and their secrets and conflicts. Lucy Klaereon is bound to the demon Ra, destined to battle him for control. If she wins, she gains his service power. If she loses, she is to be killed. But Lucy’s family see her as weak, and nobody believes she’ll be able to win. While traveling in Venice in 1837, Lucy Klaereon, in order to save her family’s honor and her immortal soul, decides to commit suicide by drowning herself in the Grand Canal. Unfortunately for Lucy, she is rescued. Her rescuers believe they can separate her from the demon Ra, whom she is destined to fight because of an ancient family pact. What Lucy does not know is that her rescuers have their own agenda. Paolo Borgia, head of a deposed magical family, wants to use Ra for his own purposes. Lucy is given an alternative, to separate herself from her demon and family, which she gladly welcomes. When she finds out the truth about Ra, Lucy’s purpose changes from not only freedom, but to righting an ancient wrong. Octavia, Lucy’s older sister, is in pursuit. She has been trained since birth to kill Lucy when Lucy loses her battle with Ra.. At the ritual to free Ra, the two sisters clash with surprising results. Octavia is possessed by Ra and Lucy is determined to free her sister and keep Ra from reshaping the world in his image. There is one small problem. Lucy has been murdered. However, she’s not about to let a small detail like that keep her from correcting her mistakes. Lucy will save Octavia, even if it kills her again. There’s a lot going on in this book. Secrets and betrayals and love and death and more betrayals and several very power-hungry characters willing to do whatever it takes to increase their magic. There’s also courage and decency and hope. Every character comes with their own background and conflicts and stories. It makes for a very good and complex story. Here’s an interview and excerpt where you can read more. Finally, I read The Rise of IO [Amazon | B&N | IndieBound], by Wesley Chu. This is a great follow-up to Chu’s books about Tao. (I reviewed The Lives of Tao here.) Whereas Tao was a highly skilled Quasing who had changed the course of human history through his hosts. the central Quasing in this book is…well, pretty much the anti-Tao. For example, one of IO’s more notable hosts was a general by the name of George Custer. Like the earlier books, this is a fast-paced SF thriller with plenty of action, and I really enjoyed it. It’s nice to see women taking more of the stage in this one, and Ella is a great character: smart, streetwise, and practical. There’s a pretty big plot thread left hanging at the end, so I assume (and hope) we’ll be getting more of IO soon. 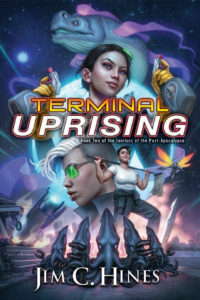 In the meantime, you can read the first chapter over at Tor.com. Catherine Schaff-Stump is an author, a professor, a conrunner, and so much more. She’s published short fiction as well as the YA novel Hulk Hercules: Professional Wrestler [Amazon | B&N]. Catherine is also a self-identified SMOF, so I asked if she’d be willing to talk a bit about her experiences working behind-the-scenes, her perspective on fandom and inclusivity, and her thoughts on our community. I’m hoping to do a few more of these interviews, because I find the conversations helpful and informative. And because you probably get sick of just hearing me babble all the time. 1. Tell us about yourself and your entry into the Wide World of SMOFs. What we meant in that conversation was that we were talking about convention planning. There are certain members of Mindbridge who shoulder a bigger share of planning and running conventions, and we meet the definition of SMOF because we do this. I’d say there are actually about 10 “full-time” SMOFs in the Mindbridge Organization, people you can count on to shoulder many of the projects through administrative or personnel management. There are many more “part time” SMOFS who run conventions certain years, or volunteer for huge jobs like Con Suite. Some of the cons call them different things, like AnimeIowa calls their SMOFS gym leaders. I don’t know why, but the idea is the same–people who work hard to pull off conventions. As the president of the Mindbridge Board, in my state, I am seen as a super SMOF. Really, the power of the board president resides in making out the agenda for our monthly meetings, but the illusory power is that some people think I can make lasers come out of my eyes and fry people I dislike. Which I’ve never done. No, never. However, the board is the public face of Mindbridge, so we try to look like real business people. Which is hard when you are super geeks just out to have conventions to have a good time. Because we wanted to be more involved in the convention planning scene, four of us from the board tried going to a con planning convention a few years back, and met more SMOFs, but we actually didn’t go back to the convention again, because we actually thought our systems for running cons were pretty good, and we’d gone to a lot of expense traveling to the convention without learning a lot that was new. So, we chat with other convention runners at their cons, and bring back good tips and trade ideas. 2. You lie. I have totally seen you do that laser-eye thing! Okay, that explains what a SMOF does, but what does “SMOF” actually mean? All right, time for a break from the intense blog posts. Let’s talk books! Last night I finished The Hundred Thousand Kingdoms [B&N | Mysterious Galaxy | Amazon] by N. K. Jemisin. Wow. I’d heard a lot of buzz about this one, which always makes me nervous, because big book buzz doesn’t always translate to a book I’ll enjoy. But I have to say, this is the best book I’ve read so far this year, and as soon as I can remember how, I’ll be recommending it for the Nebula. Was it a perfect book? No book is. But I loved the narrative style, I loved the worldbuilding, I loved the gods and most of the characters. It was a very well-written fantasy that sucked me in and kept me up late for the past two nights to finish it. Jemisin has the first three chapters posted on her web site. Go forth and read. I love being a writer 🙂 I’ve also got a copy of Nnedi Okorafor‘s Zahrah the Windseeker [B&N | Mysterious Galaxy | Amazon], which I picked up at her signing in Lansing last week. What about you? What have you read and enjoyed lately, and what are you looking forward to picking up next?